Preheat the oven to 400 degrees F and line a sheet pan with greased foil. Mix together ground chicken, eggs, bread crumbs, and Basil Pesto Sauce until well combined. Scoop out a tablespoon of the mixture, roll into a ball and place on the sheet pan. Repeat to make about 18 meatballs. 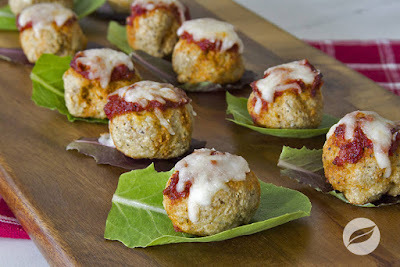 Top each meatball with tomato sauce and bake the meatballs for 15 minutes until cooked through: 165 degrees F. Turn the broiler on high, top meatballs with mozzarella cheese, and broil for 3 minutes or until the cheese is melted and lightly browned. Serve hot.